The Union Minister for Health & Family Welfare, Shri J.P. Nadda, the Minister of State for Power, Coal, New and Renewable Energy and Mines (Independent Charge), Shri Piyush Goyal and other dignitaries at the signing ceremony of an MoU between Govt. 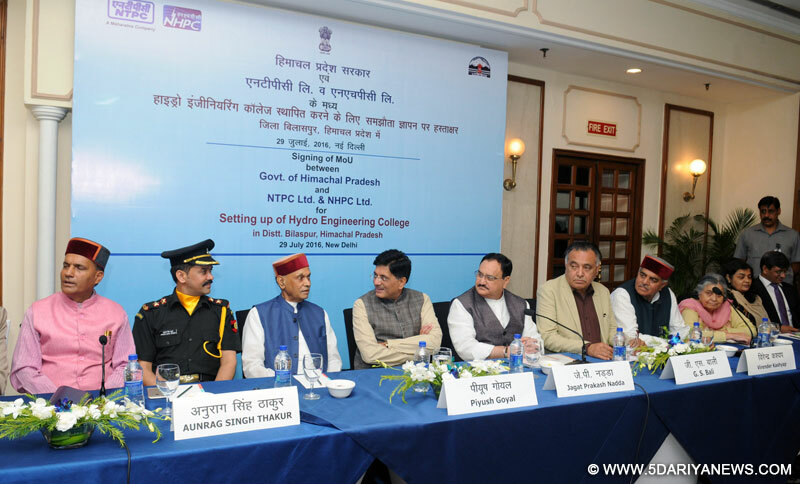 of Himachal Pradesh, NTPC Ltd. and NHPC for setting up of Hydro Engineering College in Himachal Pradesh, in New Delhi on July 29, 2016. ‘Setting of the first Hydro Engineering College at Bilaspur shall boost regional development and provide more job opportunities for local educated youth and make available specialized work force to NTPC and NHPC. It is indeed a historic moment’. This was stated by Shri J P Nadda, Union Minister of Health and Family Welfare on the occasion of the special MoU signed today between Government of Himachal Pradesh, and NTPC & NHPC for setting up a Hydro Engineering College at Bilaspur, Himachal Pradesh. Shri Nadda was the Guest of Honour at the signing ceremony in the presence of Shri Piyush Goyal, Union Minister of State (Independent Charge) for Power, Coal, New and Renewable Energy and Mines in the Government of India, Shri Prem Kumar Dhumal, former CM, Himachal Pradesh, and Shri G S Bali, Minister, HP. Also present at the function were Members of Parliament Shri Anurag Singh Thakur, Shri Virendra Kashyap, and Ms. Viplav Thakur. Shri Nadda expressed gratitude to the Hon. Prime Minister for his guidance, leadership and the vision of development of the country and his people-centered ideas and thoughts which are being translated into development projects of the country. He also thanked the Power Minister Shri Piyush Goyal for taking up the project in his home town and constituency, Shri Nadda stated that the establishment of this institution will help in generation of a Technical Human Resource specialized for specific requirement of Hydro Power Projects create manpower to serve the country for many future hydro projects. He added that “this initiative of a specialized engineering college dedicated to hydro engineering would be unique not only to our Country but perhaps globally as well.” The Health Minister further stated that Hydro power generation particularly in Himalayan region requires a combination of technical skills spanning different fields of engineering – civil, hydrology, mechanical, electrical engineering etc. Thus, there is a felt need to have a comprehensive and specialized field of study – Hydro Engineering College would be an appropriate model, Shri Nadda elaborated. Shri J P Nadda expressing his happiness congratulated the NHPC and NTPC and State of Himachal Pradesh for collaborating in true federal spirit for making this long standing project a reality, and said that Hydro Engineering College was conceived in the year 2009 and today the long cherished dream is being realized through signing of this Memorandum of Understanding. Speaking at the occasion, Shri Piyush Goyal will provide avenues for higher/technical education in the state and youth of HP shall not have to go to faraway places for being technically trained and skilled. He said that he was sure that the College shall develop into a Centre of Excellence. Shri G S Bali, expressing gratitude to the Union Government stated that the College shall be another chapter in the development story of the State, and will help in creating more job opportunities for the educated local youth too. The State of Himachal Pradesh possesses more than 20,000 MW Hydropower potential and NTPC and NHPC are engaged in operation and construction of many projects in the State.